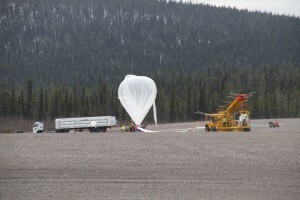 On October 10, 2015 at 09:16:54 UTC the BEXUS 20 stratospheric balloon was launched from Esrange in Kiruna, northern-Sweden. On-board was the CPT-SCOPE instrument developed by students from Norway and Germany alongside two other student experiments HACORD (Belgium) and COSPA (Germany). The CPT-SCOPE team was the first Norwegian participation selected by European space experts for the Swedish-German BEXUS program which is supported by ESA and other organisations. The Cosmic Particle Telescope (short CPT-SCOPE, www.cpt-scope.com) uses an IDEAS VATA465 to detect secondary cosmic particles in the lower and middle atmosphere. During the flight, lasting some 4.5 hours, a floating altitude of 28 km was reached and maintained for a little over 2 hours. During this time the balloon covered some 170 km ground range and the experiments landed safely in Finland. The instrument took particle event data using its two particle telescopes containing a stack of four silicon sensors and absorbers, as well as environment data. The device was remote-controlled via the BEXUS E-link system. The two IDEAS VATA465 aboard fully functioned and withstood the harsh environment exposed to in the stratosphere. Indeed, the instrument also continued to function after the landing totalling to over 25 hours of battery-powered operation. Several thousand particle hits were detected and are now under analysis. Preliminary results are to be presented at a conference in Padova in mid-December 2015. CPT-SCOPE was supported by IDEAS throughout all phases of the projects. In fact, IDEAS was the main sponsor of the instrument and its students. Two students, Julian Petrasch and Timo Stein, performed their Bachelor and Master thesis, respectively, at the company headquarter in Oslo. Several other students were working on the instrument development. IDEAS offered them a dedicated CPT-SCOPE laboratory and office space. The fruitful collaboration shows the importance of collaboration with students at an early stage and is supported by its successful outcome. Timo was later hired by IDEAS. He now continues his work using IDEAS ICs towards a space instrumentation development for nano- and picosatellites. From the distance: BEXUS 20 balloon a few minutes before launch. Image credit: CPT-SCOPE. Ready for launch! 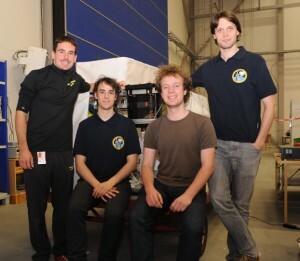 Group picture with the CPT-SCOPE instrument (central black box). Campaign team members in Kiruna, October 2015. From left to right: Lucas Kempe, Anton Walter, Julian Petrasch and Timo Stein. Image credit: S. Mawn, ZARM. 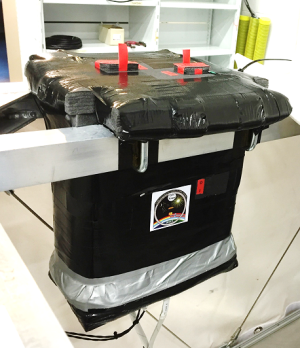 The CPT-SCOPE instrument (black device) mounted inside the BEXUS gondola. Image credit: CPT-SCOPE.